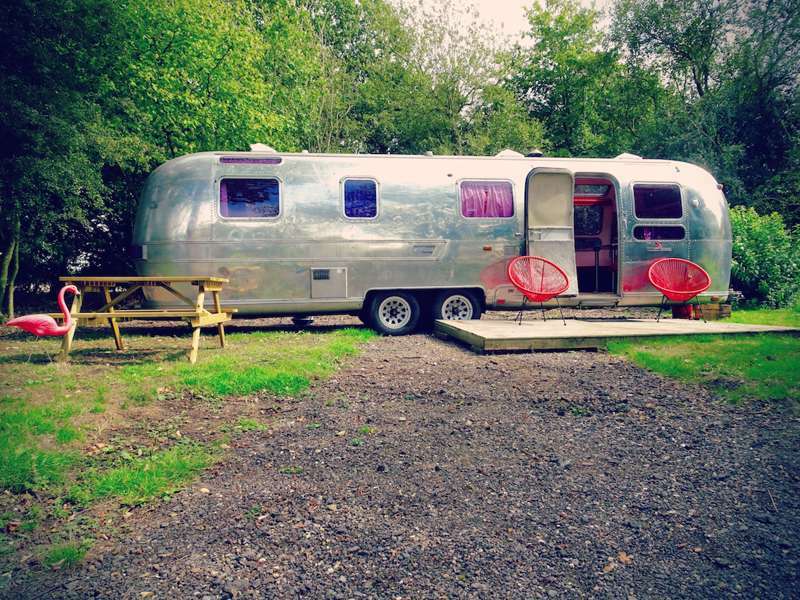 A huge and stylish 1970's American Airstream. Situated in a little wood with three other vintage American trailers in summer and alone from Autumn - Spring, the Sovereign has been recently restored with a cool 1970's vibe paying homage to its era. The Sovereign has a fixed double bed with memory foam mattress at the rear of the caravan plus two space age bunk 'pods' for kids to snuggle down in. It has a fully-equipped kitchen with a four-ring gas hob, kettle, fridge and grill. Tea and coffee and a locally-sourced breakfast hamper are provided for your arrival. It also has under-bed storage, hooks and hangers, large dining area, two small radiators, log burning stove, electricity via UK plug sockets, blankets, DAB radio with iPod cable, lantern and torches, umbrella and a chemical toilet for night time emergencies. Outside the van is a decking area with a picnic bench, deckchairs and a fire pit (logs available). Seven acres of land to roam.